If you’re missing multiple teeth, you may face a number of daily inconveniences. You may find it embarrassing to smile, and it might be difficult to eat all of your favorite foods. You are also at an increased risk of oral health problems, such as dental drift and premature wear and tear on your remaining teeth. It is vital that you replace your missing teeth! Let’s discuss your options for filling in the gaps and regaining a fully functional set of pearly whites. There are a few options for replacing multiple teeth, and each one comes with distinct advantages. When you visit us for your consultation, we will thoroughly examine your mouth and recommend a treatment that best fits your circumstances and goals. Then, we will get to work on creating a plan for you to regain a healthy, complete smile. 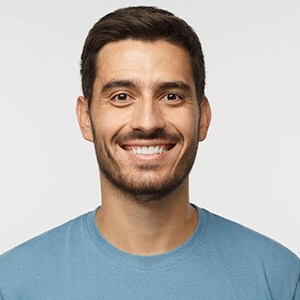 A fixed bridge is a dental prosthesis that has two crowns, which get placed on top of the remaining healthy teeth that are next to the empty space in your mouth. Between one and three false teeth “bridge” the gap between the crowns. A fixed bridge is a relatively quick and affordable procedure that can provide years of improved chewing function. It can also prevent dental drift and deliver pleasing aesthetics. 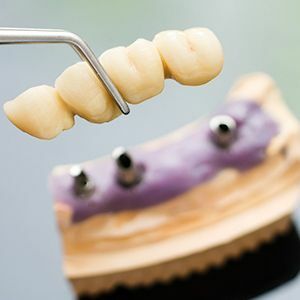 Instead of relying on your remaining natural teeth for support, an implant-supported bridge gains its strength from small titanium cylinders that get placed below the gum line; they serve as substitute tooth roots. The implants are attached to crowns, which in turn support artificial teeth that fill in the empty space. An implant-supported bridge tends to last much longer than a traditional fixed bridge, and it delivers superior strength and more natural function. A traditional partial denture replaces multiple teeth throughout an arch, even if the empty spaces are not adjacent to one another. It uses clips or other mechanisms to remain secure in the mouth. An implant-supported partial denture works a little differently. It snaps onto strategically placed dental implants, making it more stable and natural-feeling than a traditional partial denture. We often recommend that patients choose implant-supported tooth replacement over traditional options. 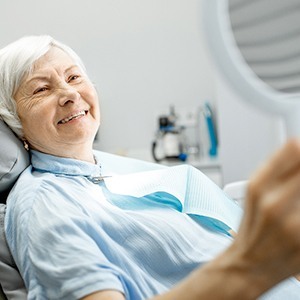 The specific implant-supported solution that is right for you will depend on how many teeth you have lost and where the tooth loss has occurred. If all of your tooth loss occurred in the same area of your mouth, an implant-supported bridge may be ideal for you. On the other hand, if you have multiple places throughout an arch without teeth, an implant-supported partial denture might be a better fit for your circumstances. 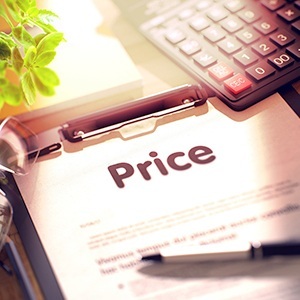 When you visit us for your consultation, we’ll provide you with an estimate of the cost of your procedure. We’ll also help you explore payment options so you can fit your new smile into your budget. Are you ready to close the gaps in your smile? Contact Jacksonville Complete Dentistry to schedule your restorative consultation today.